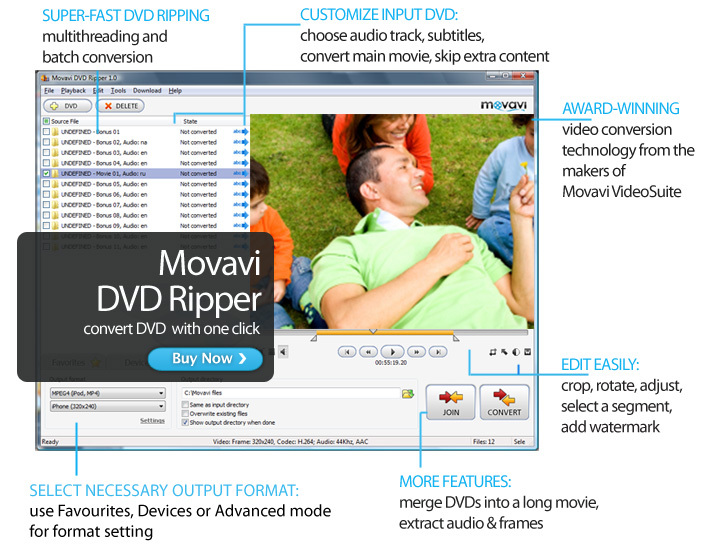 Movavi DVD Ripperr is a simple yet smart and powerful video converter. Convert DVDs for saving on iPod, PSP, PDA, Cell phone, Zune with high conversion speed. Output formats: AVI, MPEG (DVD, VCD, SVCD), MPEG4 (MP4, iPod, PSP), FLV, 3gpp, 3gpp2, MOV, WMV, RM, WAV, WMA. Use Join feature to merge multiple VOB, DVD, IFOfiles into one large movie file. You can add as many files of any formats as you need to the list and combine them fast and easy. Use Movavi DVD Ripper and save your DVD to any video format: AVI, MPEG (DVD, VCD, SVCD), MPEG4 (iPod, MP4, PSP), 3gpp, 3gpp2, FLV, MOV, WMV (for Zune ), RM. Just select the needed IFO files from your DVD, select the language, choose the output format, and - save your video! It's pretty easy to publish your video files on the web with Movavi DVD Ripper! Just convert your movies to MOV, WMV or RM formats which are ideal for streaming video on the internet, upload them to a web server - and share with your friends.